Miao Xiaochun is considered one of the most representative artists in the domain of China¡¯s new media art. His recent works seem to be a stimulant to the slow-going Chinese contemporary art circle¡ªwe have the confidence that a new value order is building in the process of returning to academics. Miao Xiaochun¡¯s work Microcosm employed the latest three-dimensional computer technology to create many montage images and virtual realities. His way of expression is based on subjective interpretations of historic artworks, especially by taking the classic paintings around the Renaissance as the structure for visual expressions. Although Miao Xiaochun¡¯s Microcosm is based on Bosch¡¯s The Garden of Earthly Delights, he turned the traditional Chinese idiom ¡°looking up the sky from the well¡± into ¡°looking down the well from the sky¡± (this is the literary translation of ¡°Microcosm¡±). If the idiom ¡°looking up the sky from the well¡± is used to descript a person with limited sight and knowledge who has difficulty in understanding the nature of things, then ¡°looking down the well from the sky¡± means if a person is put into a macro environment to examine micro things, he would have difficulties to understand the nature of things too. In these two phrases, the spectator¡¯s positions are changed, but he encounters the same limits in understanding things, which shows the significance of this work. Microcosm is not to rebuild the trueness of historic image, rather it is to reinterpret and convert the historic image and derive new meanings from the image spectrum, or to de-structure the historic meaning by using an artist¡¯s own emotions, or to take care of and translate the target from personal visual experiences, so as to create a psychological medium analysis¡ªto recompile modern images in the tangled relations among reality and virtual reality, familiarity and strangeness, closeness and alienation and individualism and non-individualism. In his works, we can see the mutual reflection, interconnection, overlapping and replacement between historic images and real images, western aesthetics and Chinese aesthetics, classic painting and new media art, humans and things, wars and peace and violence and pastoral. In these processes, an abstract piece is recreated that both attract us and puzzle us. This is a baroque style ¡ª grand and spectacular. On February 8, 2009, Miao Xiaochun and I had an impressive talk. It is impressive because not only that the talk touched all the above mentioned subjects, more interestingly, we two are both art practitioners with the same background but different approaches¡ªit is a talk between an artist and a curator both with the background of art history. Different experiences constituted the contents of this talk, including the fundamentals for judging art history and different interpretations of modern art, the insight of a curator and the practical description of an artist, and the discussion on differences between western and eastern aesthetics and the art philosophical analysis in a social context. Huang Du (thereafter referred to as Huang): Your works have attracted a lot of attention in recent years. They have been exhibited in many important domestic and foreign museums and art projects and have received various comments and remarks. However, few people actually know about your experience, such as your education backgrounds and how do you become what you are today. I think people are always curious about artists¡¯ experiences, hence it might be necessary for you to explain your experience to readers, audiences and art fans. As far as I know, you studied German, then shifted to art history research, then gave up art history for painting, then went to study in Germany, then gave up painting for photography and then did a lot multi-media creations. Could you briefly descript the whole process? Miao Xiaochun (thereafter referred to as Miao): The reason why I studied German is because I didn¡¯t get into any art academies. That¡¯s why I studied German literature in my undergraduate years. But I found that I was still interested in arts, so I applied to study art history in China Central Academy of Fine Arts for a master¡¯s degree. After graduation, I spent some years painting. In 1996, I went to Kassel Academy of Art to study plastic art. In Germany, I opened my views and stepped into many areas. My graduation work ¡°Culture Shock¡± is the combination of photography and sculpture. I also spent a relatively long time doing photographs, from the time I was in Germany to now. Since 2005, I have become more and more interested in arts created by digital medium especially by computer software. That¡¯s why I made The Last Judgment in Cyberspace that year. After 2005, I have been adopting this method all the time . The series of Microcosm shown in this exhibition is also made by three-dimensional software. That¡¯s roughly the whole process. Huang: For a period, you focused your photography on objective reality: China¡¯ rapid development and changes. Especially since late 1990s or since the twenty-first century, China¡¯s urbanization process has picked up huge momentum, spreading from the super-big cities (Beijing, Shanghai and Guangzhou) to second tier cities (Suzhou, Nanjing, Changsha, Chengdu etc). I found that what were showed in your photos were things closely related to urbanization. Because modern urbanization involves many political, social and cultural uncertainties (frictions, conflicts and events), you recorded these urban changes in your photos. Of course, the ¡°record¡± was not a very strict objective record; it contained both realities recording and subjective analysis of realities. My question is why did you choose this perspective? Miao: Urbanization is the subject that I have been pursuing since 1999 when I returned to China from Germany. The works shown in ¡°Urban Creation¡±- Shanghai Biennale 2002 and ¡°New Urban Reality¡± in Netherlands(Museum Boijmans Van Beuningen, Rotterdam, 2006) were all about cities. In recent two or three decades, the changes brought by urbanization are too huge for artists to ignore. That¡¯s why I spend seven or eight years doing the same subject. I use photography because photos can better reflect these changes. But just as you have mentioned before, there are also subjective factors. They are not pure objective recording. I prefer to make photography like painting, because pure photography can only represent a fragment of events, for they are just pieces of the real world. I like to make something with big scale and grand scene and to integrate all the pieces into the grand scene. Then the spectators themselves can find out these pieces. Huang: You tried to capture a historic moment and a real history. Then how did you handle the relationship among recording, reality and realism? Miao: Among all art media, photography has the most natural feature of recording realities. No matter how many subjective factors you add to it, it still has something to do with reality. Photography and reality are inseparable. Painting can start from internal feelings, but photography can only be started from reality. I respect this. Even though I want to make my works like frescos, yet all details are real. I try my best to accurately reflect all details in the real world. Huang: Going back to your early photography works. At the early days, you did not photograph pure real objective targets. You did not adopt Jeff Wall¡¯s staged photography. Rather, you conducted object photography first, which is more similar to Andreas Gursky¡¯s manner. But you were still different from Gursky, because it seems that you employed cavalier or scattered perspective in post-production. My question is how did your post-production lead to the differences between you and Gursky? Miao: The early stage of photographing is completely objective and real, because I think there is a bottom line in photography. At first, there should not be too much fancy deeds, just photographing what is in front of you. While in the post-production, you can re-organize and re-compile the pictures according to your subjective feelings. If I am recording an instant through photography, then through post-production, I can change the nature of times. For example, a same person can appear in different places in a photographed picture. This is different from traditional photography in terms of times, a little like video-recording: putting a person¡¯s actions in different times within a picture, thus changing the instant nature of photography. This is the first point. The second point is that the traditional photography is usually confined by the physical features of equipment. Take the angle of view for example; it is only the angle of a certain camera. But through post-production, the angles can be changed. By that time, the original complete linear perspective of photography is changed to somewhat like cavalier or scattered perspective. I think the western art circle does not have the tradition of cavalier perspective. Andreas Gursky might not think this way: I have to change it in perspective. In addition, he might not be used to changing the instant feeling of photography to put different times in a picture. This might make him uncomfortable. But for a Chinese artist, because of the tradition of cavalier perspective, and because different times of a same person can appear in a picture, he might feel natural to employ cavalier perspective. In ancient Chinese paintings, the same figure can appear in different places, such as walking from bridge to pavilion, drinking with friends there and then climbing up mountain¡­ Therefore, in a scroll, people¡¯s behaviors in different times can all be put there. I follow this mindset while making photographs. In my work Celebration, there are many people appearing in different places to demonstrate the changes of times. Huang: This is the most fundamental principle that defines our difference with western artists. In other words, the principle of narration is different in Chinese arts and western arts. The aesthetics in traditional Chinese art means the completeness of a story constituted with repeatedly showing one figure in different places which forms a story line. Miao: Right. It emphasizes more on subjective feelings. I did come from the foot of a mountain to its top. I have gone through this process, thus it is natural to put the pieces together. When I saw the scenes, I feel like I see the whole story. Hence it is an expression method which focuses on subjective feelings, and is employed in photography even though photography should be objective. Huang: In your work Celebration, the repeated appearance of the same characters in different places is the concrete implementation of traditional Chinese painting aesthetics. What purpose did you try to achieve through the repeats? Miao: Spectators of this work may feel like they have stayed there for three hours to watch the celebration from the beginning to the end. The first glance may make you feel that it has just caught an instant. But if you examine it carefully, you may realize it is not the case. Huang: The conformation of photography before 2005 was: an objective reality (Miao¡¯s words: an objective presentation) and an internal world constituting a photography language. After 2005, you initiated a change, turning to analyze and dissect some classic western paintings by some famous painters, such as Netherlands¡¯ Hieronymus Bosch, and Michelangelo¡¯s The Last Judgment¡ªthe most famous painting during the Renaissance. Why did you choose historic artworks as targets to dissect? Miao: Facing a real and changing world, I have the desire to record it and freeze it, but not to analyze it, dissect it, or to re-present it. But for the works that record the past, I indeed have the interest to analyze and illustrate it, to make it solid and alive again. Art has provided a lot of materials for us to recreate. Fortunately, we are vastly different from ancient people. When they were creating artworks, they had nothing to refer to. For example, when they were making cave frescos, they could not take reference from anything. When they were drawing an ox, they just draw it according to the image they got from life. For them, they probably had no sense of art history at all. But when we are making creations now, we can start either from real world or from the art world which goes parallel with the former. We can learn something from art history. This is the interesting part. So now we have a long history of art, where there are so many things which we can use as raw materials for recreation. When we are doing this, we do not have to worry that these things are from western art history. We do not have to think whether they are in the art history of China, or of Netherlands, or of Italy, or of Germany, or of Britain. To us, they are just cultural legacy left by our predecessors. What I chose are complex works in western art history, no matter they are about structure or characters, such as Michelangelo¡¯s The Last Judgment and Bosch¡¯s The Garden of Earthly Delights. I am thinking that as an oriental, I am more courageous than western artists. Provided there is an Italian artist, when he is re-interpreting Michelangelo¡¯s works, what would he think, would he feel afraid? But I remembered that when I was doing a three-dimensional work based on this, I felt very happy, without any sense of burden. Maybe it is the unknowing that makes me bold. Huang: In fact, some artists rely on their intuition for creation; some rely on their accumulation of knowledge, experience and judgment. The reason why you choose famous western artists as analyzing targets is still related to your experience on art history research. Without that as a basis, it is hard for you do decide which artwork to choose. I think this might be a difference. Miao: It might be one of the reasons. Huang: I read your personal profile and there was an interesting self description: Bosch¡¯s art is only one of ¡°my starting points. I actually do not particularly care about what Bosch¡¯s work is intended to show. What I want to reflect is the soul of the work. This is more important, or else I would be an art historian rather than an artist. My works do not descript the contents of Bosch¡¯s work, I only use the form of Bosch¡¯s work to express my own thoughts.¡±¡­ My question is ¡°I want to reflect the soul of the work¡±¡­? Miao: This is probably a version translated from English to Chinese. It does not exactly reflect my meaning. I have a Chinese version and the main message is like this: What Bosch created was based on the allegories of his time. There were many details, each of which reflected an allegory. Actually 90% of Bosch¡¯s allegories were beyond my understanding. What I want to say is that I may not have to understand them all. I am not doing art history research. I heard that some people have done a thorough research on all Bosch¡¯s allegories and have written a thick book about them, with each allegory marked with its origin. But I have to create it with my own language and to swap all the contents with modern things and make it a modern story. This can reflect my view and feeling in our times. I think the final story is like this: I do not understand Bosch¡¯s work and the meaning it represents; but if Bosch would look at my works, he could not understand mine either. He would not be able to understand many things, such as this spaceship which can fly into the sky, but is was not in existence in his times. If he had looked at my works, he might ask what this monster is. There are many weird creatures in his works, making his works like dreams. I can not understand them, and I do not intend to. He may not understand my metaphors and thoughts either. But I feel this is more interesting. We just express our own things. He stated his times, thoughts and feelings and I voice my own. I think they go in parallel. His works are my starting points where I used his structure, such as his structure of heaven, earth and hell and the basic forms of his pictures. But I only use these forms and changed all contents, including figures, backgrounds and all facilities. What I create belong to our times, they are mine. He dreamed his dreams and I do mine. Huang: That¡¯s good then. You only adopted the structure of Bosch¡¯s painting and his narrative pattern (Miao: yes, you are right). You actually compiled another set of allegories. Then what are the meanings of your allegories? Miao: They are modern people¡¯s dreams. They reflect modern people¡¯s views on life and death, their desires and their view on human¡¯s weakness. We can make some comparisons. Take the Dance of Death for example. In his painting, there was a person shaped like a tree, and a group of people danced on his head. I can not figure out what these people represent. My Dance of Death happened on a laptop computer and a skeleton danced there, an image that did not exist in Bosch¡¯s times. If we are going to have nuclear wars, the final command might be sent by pressing a button. Bosch could not imagine that the command could be sent by a computer, neither can he imagine powerful weapons of our times which have the capacity of destroying the earth hundreds of times. Therefore my Dance of Death is like this: on a laptop computer, Death dancing, nuclear war starting, total destruction¡­ It is totally a fear of modern people and concerns of modern people. Huang: That means this artwork that you create is actually a ¡°transposition¡±? Miao: Yes. Especially the concepts concerning Adam and Eve are changed, which is the most difficult part: because this work only employed ¡°a single¡± three-dimensional model and this model is a male who can not represent both men and women. Therefore finally I came up with such an idea: use a robot to represent Adam and Venus for Eve. My consideration is: we modern people are just like god in the way that we create a lot of robots according to our will and ask them to do as we direct. In this perspective, it is like god creating Adam and Eve and telling Adam that he should follow his rules. Next is Venus. Why do we always think the Venus with broken arms in Louvre museum is the most beautiful one? I think one possibility is that this Venus does not have arms, which means she can not pick the forbidden fruit as Eve did. From this point of view, this image can be used to replace Eve and reflect the thoughts of modern people. There are many such cases in my work, and I have to do the same work in every detail. Huang: This work actually has some features that are the same as the ones in Bosch¡¯s work. Though their meanings are different, yet both of them have something identical and immortal. Huang: For example, I think to exhibit the process from birth to death and to look down the hell from heaven, look up the heaven from the hell, look at the end from the beginning or look back at the beginning from the end are the meanings of this work. Even though you present or metaphor modern reality or your philosophy of looking forward to the future, this work in the whole still has the same things as the ones in Bosch¡¯s work. It is only that the space and time are changed¡­. Miao: Right, the structure. In terms of birth, death, heaven, earth and hell, their general structures are similar, but with different view points. In Bosch¡¯s work, the heaven, earth and hell go in parallel or one after another. They may also go along with the time. But through the nine screens and after three-dimensional transposition, they developed a tangled relationship. By using the relation between side screens and front screens, we can look down the hell from heaven and look up the heaven from the hell. This is no longer a parallel structure, it is a tangled structure. There is a co-relation. Through the side screens, the three spaces are linked together. The issues under discussion are the same, such as birth and death. But the ways of observing them are different. Huang: The difference is: you use a modern technology to rebuild it, and by doing this you actually change the relation and form between times and spaces. In traditional western art, there is always something called ¡°logos¡±, which means ¡°logic¡±. It started from ancient Greek civilization, then gradually developed and evolved into ¡°contradiction¡±, or binary opposition. I think, as a Chinese artist, your job is not to make the logos (or logic) or binary opposition as the targets of expression or analysis, but to abstract and express the chaos, ambiguity and co-relation in Chinese aesthetics. It is just like why we do not consider yin and yang as oppositions (Miao: right). Is this also the position where you start your consideration? Miao£ºI think this is the most interesting part. In a western view, objects are positioned either up or down and things are either good or bad. But for me… In fact, when Chinese create artworks, they have a subconscious believing that a good thing is not necessarily 100% good and a bad thing is not necessarily completely bad. Then conflicting ideas appear in artworks, or maybe something different from complete logic might exist. I found this when I first started doing The Last Judgment in Cyberspace. When I did the transposition of one model replacing all characters in Michelangelo¡¯s artwork, I suddenly realized that there is no distinction between good people and bad people here — because I used the same model: who is good? Who is bad? Then there is no difference between heaven and hell, or even up and down. At that time, I suddenly felt that I can tolerate this; I can tolerate this confused feeling. Thinking back, looking at the deep-rooted reasons, this is related to Chinese philosophy, just like you have mentioned. Therefore, I could take a modern medium to create artworks; I could take a western artwork as an element to elaborate; but subconsciously there are still a lot of Chinese elements and oriental elements. Huang: Therefore, from a modern perspective, you interpret the narrative principles in the works of famous painters. The metaphor of the interpretation¡ªa modern metaphor of interpretation is not an objective metaphor that rebuild history; it is converted into a new metaphor which represent your view on the past, the present and the future. Miao: Yes, this is what I¡¯m interested in. Huang: Another question. It is about Bosch¡¯s famous The Garden of Earthly Delights. While you were creating, why did you adopt the structure of a Chinese folding screen? Miao: We don¡¯t have to look at it as a folding screen. A screen has a practical function: for it to stand up firmly, it has to be folded. In addition, every image on the panels has a parallel relationship. But here, it appears to be a screen, yet its function is no longer a screen. Because these two panels (pointing at the two side panels of the nine-panel complex work) serve the function of looking from here to there; their goal is to connect the three scenes. The artistic form is a folding screen, but it is not one in essence. In addition, this is a different form than western altar paintings. The relationship between altar paintings is still a relationship in time (Huang: A-huh), and there is no mutual-looking in terms of space. Huang: You established a relationship in another space context. Miao: Yes, relationship in terms of space. For Chinese folding screens, several panels might represent the same image or they have a parallel relationship. For example, spring, summer, autumn and winter; this is about a change in time and there is no spatial relationship. Miao: I indeed want to establish such a spatial relationship. To establish such a relation, I used the technology of three-dimensional software. (Huang: Um) This software can precisely establish this ¡°mutual spatial¡± relation. This is not very feasible in ancient times: it is too difficult to accurately depict a grand scene from both the front and the side and the results will not be good; it is almost impossible. With modern technology, it is easy to make it possible. Once I create this grand scene into a three-dimensional set, it is easy to look at this world from a side view. (Huang: A-huh) Then I can use one side panel to establish a spatial relation between several scenes. 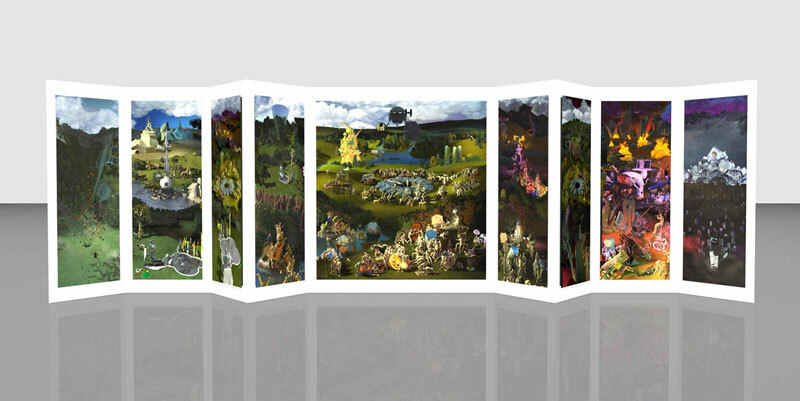 This artwork appears to be a folding screen, so it is called a nine-panel screen. Yet it is not a screen in essence, and it does not serve as a decoration. It creates three scenes — heaven-earth-hell — a connection in spatial terms. Just like we talked about, this spatial connection reflects how an oriental artist connects heaven, earth and hell together to represent you within me and me within you. This possibly reflects an in-depth concept in philosophy or in cultural tradition where those three things can be considered at the same time; and this is different from only having either good or bad. During Bosch¡¯s times, he used just one scene, even there are three¡­ even it¡¯s a triptych. Of course this word ¡°triptych¡± already has a strong sense of time. But modern artists have more tools and means. I can make a static object into a dynamic one; I can change a two-dimensional object into a three-dimensional space¡­even if it is a virtual space, it is still a different way of spatial expression. Huang: I have another question: when you were creating Microcosm, you first considered the static status, and then shifted to dynamic status. What are the reasons that prompt you to make the shift? Miao: In fact, for this piece of artwork, I considered the static and dynamic status at the same time. Just like I worked on Michelangelo¡¯s The Last Judgment, I made a plane artwork into a three-dimensional piece — of course it is a virtual three-dimensional work; thus I am capable of looking at Michelangelo¡¯s fresco from other perspectives — from the side, top and bottom. You can only look at a traditional fresco from its front; but with the transformation using three-dimensional technology, it can be looked at from multiple perspectives. That means a two-dimensional plane work is transformed into a virtual three-dimensional thing; and this is the first step. The second step, Michelangelo¡¯s artwork is static and soundless. When it comes to me, I can turn it into a dynamic three-dimensional animation with sounds, a dynamic and living thing. Same as Microcosm, it is probably true that static status is easier to be presented and achieved, and it takes longer to create a dynamic status — it takes about 6 months more to achieve dynamic status compared with static status. Until now, I¡¯m still making small changes, and it took another 6 months. Huang: In your works, no matter The Last Judgment in Cyberspace or Microcosm or three-dimensional computer animations, they all share a feature: you virtualized your own body into your works. When it is transplanted into these spaces, the body became impersonalized. Your body no longer belongs to yourself, rather it is the need of the artwork; it is a symbol that expresses certain messages. Why did you use your own image as a target to be transplanted into your pictures or animations? Miao: There are only very few images artists can use nowadays. We can take a look at the art history. In the middle ages, all artworks are about the Bible, Jesus Christ etc. However, in our generation, maybe people don¡¯t have such beliefs and we will not use those figures anymore. Maybe during the Cultural Revolution, we know what kind of characters to use—¡°Worker-Peasant-Soldier¡± images or the image of our great leader. In our generation, the most available images for artists to use are themselves because their own images are easily available and least controversial — there won¡¯t be any personality rights issues. It is the most private image that could be symbolized. I ask myself: other than this image, what else can I use? I seriously couldn¡¯t find any other images to use at all. Then I¡¯m no longer troubled by this. In fact, when we carefully examine artists¡¯ artworks in history, they use ¡°one kind¡± of images more or less which are somewhat related to themselves. Take Michelangelo for an example; whenever you see one of his works, you know immediately that those characters are created by him. There is a sort of unique characteristic about men and women that he created; even his female characters have masculine characteristics. From this sense, he is using the same kind of image. Almost all artists are like this. Then I thought, I¡¯ll just continue to do it this way. Huang: Actually, it is obvious that human body is complicated. If you want to understand and analyze human body, you only have three options as to where to start from: natural body, socialized body or science body. In your works, you are using your own image as an agent of expression, then why did you choose body? Miao: Probably because a body is more of symbolization. Once a body puts on clothes, there will be some sort of representation; for example, a certain time, a certain social class¡­ If I only use the body, these representations do not exist. Miao: All identities, ethnic characteristics, cultural backgrounds, nothing; it is just an image of ¡°a person¡±, a symbol for ¡°human¡±. It only represents the ¡°existence of a person¡±. Then we can talk about abstract issues, issues like birth and death etc. Huang: In your three-dimensional work Microcosm, aside from the pastoral context, I also feel an interpretation of issues concerning violence¡ªthe violence does not only come from man-made wars, but also exist in human¡¯s ideology, and there is even violence derived from the magnifying of press information due to technology advance. I think your works seem to be consistent or proved French philosopher Jean Baudrillard¡¯s theoretic analysis of violence. In 2002, I participated in the 2nd Seoul International Media Art Biennale 2002 as curator. During this Biennale, Baudrillard was specially invited to give an important lecture titled Violent Images and Violence done to Image. In Baudrillard¡¯s view, violence has three forms: the primary form is the unilateral violence of the most powerful, such as aggression, oppression and spoiling; the second is that of historical, of critical violence, the violence of the negative and the transgression of revolt and revolution (including the violence of analysis and interpretation); the third one is different from the aggressive violence, it is subtle, deterrent, consensus and hyper-regulating, even therapeutic, inherent and communicative, sometimes transparent and not harmful. The third one is what we call violence of information nowadays. It is showed in information, media and images, and it is derived from images. Its main consequence is leading to the disappearance of reality. In a picture, the content violence is separated from the agent violence. When agent violence is converted into information, the violence occurred in the process of the integration of agents and information. Obviously, Baudrillard¡¯s analysis of violence forms is inspiring. In your works, do you have such interpretations of violence? Did you use virtual technology and computer software to express your thoughts about these issues? Miao: Yes, maybe some sort of mysterious and invisible violence has profound impacts on us. The robot appeared near the end of the animation is consisted of 11 television screens. All screens are re-playing how the fire-fighter ran wildly in the fire. One of the characteristics of our times is that there will be some sort of image recording for sure when something happens. Either it is a terrorism attack or a natural disaster, the event, after it happened, will be played over and over again in a global scale. Then this event is magnified by many times, forcing countless people — related or unrelated — to face this event together. Huang: Your work Microcosm easily reminds people of an artist group AES+F¡¯s [Tatiana Arzamasova£¨A£©, Lev Evzovich£¨E£©, Evgeny Svyatsky£¨S£©and Vladimir Fridkes£¨F£©] Last Riot exhibited in the Russian Pavilion during the Venice Biennale 2007. They created an historical artwork with grand narratives as well. Of course, the creation process is different for you two, but in terms of the form — I¡¯m talking about the similarity in the visual language — it is video equipment consisted of three screens. It utilized the combination of real person shows plus 3D animation to create a video artwork with 180 degrees of vision in a half circle. In fact, AES+F adopted the most common commercialized production method of contemporary art. They selected professional models from modeling companies, and their props are from a famous sports brand Adidas including sports shoes, shorts, baseball bats and golf clubs. We even see Evian spring water several times in the video. This is suitable for commercialization, but it also implies the criticism of globalization. AES+F¡¯s artwork has a clear target in terms of concepts — it depicts religion, civilization and the conflicts between different cultures; and all of these are expressed by beautiful youth figures fighting each other from the start to the end. Not only did AES+F analyze violence in reality, but they expressed the despair, anger and criticism about the current situation that humans face through their interpretation of violence. This artwork precisely presents the perfect and lively plot conflicts and contradictions through peculiar details and dazzling shots. There is something montage about this group¡¯s artwork — it integrated all kinds of things such as Japanese temples, Chinese dragons, oil fields, Islamic mosques, Rome historic sites of Christian, ice mountain, dessert, wasteland, hanging bridge, carousel in Disney land, tents of military bases, airplanes, golf clubs, military knives etc. All of those are combined in a montage way. It also has a kind of allegory ¨C birth and death, violence and war, uneasiness and anxiety caused by conflicts of tradition and modern times. Your artwork also contains such conflicts and contradictions. I believe that the ultimate meaning is related to the development of human kind. So how do you look at the differences in terms of concepts and languages between your artwork and AES+F¡¯s artwork? Miao: I think this is the best question! It is the most interesting to decide when to look at these two artworks at the same time because there are many things that could be compared and discussed about the two pieces. AES+F combined real person shows, actual camera shots and three-dimensional virtual scenes, and they used Primatte Keyer technology to mix them into a tree-dimensional set. Therefore, although there are many killing movements from the start to the end, none of the movements became an actual cut; this is vital to human lives and it shouldn¡¯t be acted out casually. For me, since I used three-dimensional virtual technology right from the beginning, everything is generated by the computer and it has nothing to do with real persons or actual scenes. Therefore, I can peel a person layer by layer or cut a person into slices; I can also make these people into potato and cucumber first and then peel him or slice him to achieve visual results that cannot be achieved with actual shooting. The characters in their work has different skin colours, mostly are young men and women, so there is a difference between individual characters. This is a carry on of their static photography works in previous years. I only used a three-dimensional self image and the copies of this image, and there is no difference among individuals. I only used this image as a common symbol for ¡°human¡±. This image was first used in 2005 when I started creating The Last Judgment in Cyberspace . Looking at the images on the three screens of AES+F¡¯s work, sometimes it is one image such as a grand scene; sometimes it shows three different images combined together. Therefore, it is better to be projected on three screens. The image on my three screens is always the same one, so I could have projected it on one screen as long as the screen is big enough. The reason why I used screen divider to project it on three screens is just to make the image bigger. This is how I consciously not avoiding similarities in creating artworks. For artists living in the same times, we face the same issues, use the same technology. Of course there will be similar art features. There are many examples like this in art history either in China or in other countries, and this is called artistic features of the times. However, every artist has different life style, different cultural background and different aesthetic taste; and this will form a certain fundamental distinction which is the uniqueness of art. In fact, at the end of creating this animation, the most exciting thing is: their artwork ended at the peak of a mountain; and my work flew into the universe, then all sounds disappear as well¡­This is the part which makes me the happiest. This is also why I decided to name this artwork Microcosm at the end. Because when you look at these things from a far away location, many things become unimportant and minimal. Maybe this is how two artworks differ from one another. The Russian group¡¯s artwork focuses more on violence. When you think about this video, it is all about knives and swords motioning continuously. At the end of my animation, we are away from all of those, and we can look at all these with a detached perspective from a far away place. Maybe this is the difference between a Chinese artist and a western artist. Maybe this new media art gives us the opportunity to throw away burdens. This young form of art only has a history of a few decades. The most dazzling thing is the upgrades of hardware and software in a breathtaking speed and the updates in concepts following that. The difference between eastern artists and western artists is only a few years away or even a few months away. With such a background, what is oriental, what is western, what is classic, what is modern, what is vanguard, what is rearguard, what is the core and what is being marginalized? Masters and classics are young, and they leave no standards and pressure for other people. Every artist can surpass the previous classic and to form his/her own classic; and they know clearly that they could be surpassed by the next person very soon. This is a phenomenon that only exists during the most active period of art development. Compared with old times, hundreds of years or decades are compressed into a few years or even a few months. Young and active minds sank in it without any fears. Then what is the most important factor in such an era? What makes this artwork worth viewing and thinking after it is surpassed by other artworks in terms of technology? Huang: When looking at AES+F¡¯s artwork, I found that this group actually select, sift and compile a set of fragmented images of different times, different spaces and different historical stages, and then use technology to integrate it into a narrative scroll about violence. Comparatively speaking, your work Microcosm does not have such a narrative method. Obviously you are trying to send out another kind of message from this even bigger universe, meaning that looking at this earth from a universal perspective as if everything happening on earth is minimal, temporary and fragmented; it is only a matter of one moment. On the other hand, AES+F started out from a more concrete subject or image. I believe that if we say the artistic language of AES+F¡¯s artwork is literary narration, then your artwork has more abstract characteristics. Miao: um, this is why I changed the Chinese saying of ¡°a frog in the shallow well looking up the sky¡± into ¡°sitting in the universe to look at the well¡± (this is the literary translation of Microcosm). For the frog living in the well, everything is comfortable and beautiful. Time and space are appropriate. The frog can never go up to the sky because it will freeze, starve and burn to death. It is born for the land and it will die for the land. It is suitable to live in the well and it uses the spatial measures of a well to consider things. Looking down from above, we cannot see this frog in the well, and we cannot tell it how big the universe is. There is no need to praise the life within a well; no need to fight each other for a small piece of land. Even if the frog uses all its power to image, it still cannot grasp the vastness of the universe. But who is to say that I am not that frog in a well? Even if I look at things from a different perspective, even when I ¡°look at the well from the universe¡±, I am still short-sighted, narrow-minded and I cannot manage or handle grand events; I am still ignorant and muddleheaded just like before. It is just that I once heard when you can create art to the level of supremacy, beyond your imagination and soul, you will get away from that muddleheaded status temporarily. One melody, one image can make people passionate, lost in rambling thoughts, and go beyond times. I wish I could get there, and I feel that even if I live in a well, I can still think big and accomplish splendid achievements.